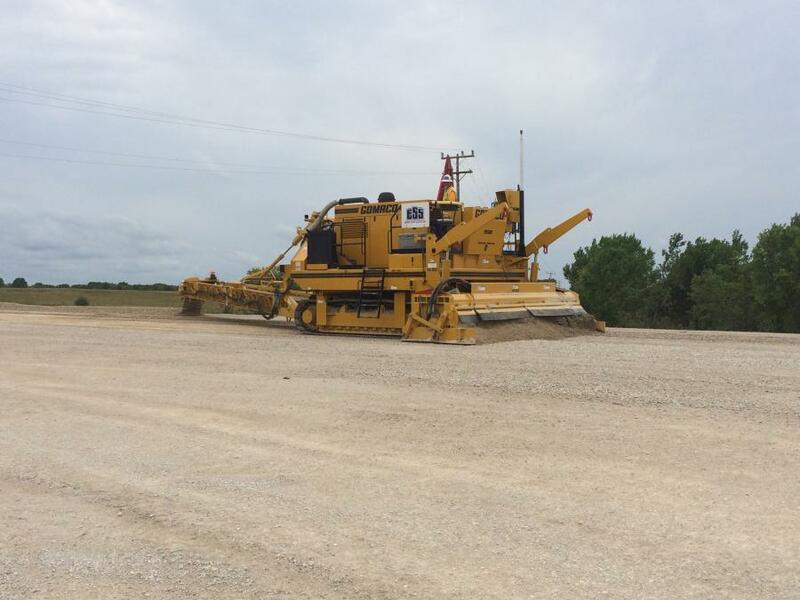 The Kansas Department of Transportation is repaving a 7.12-mi. section of U.S Route 169 in Allen County. 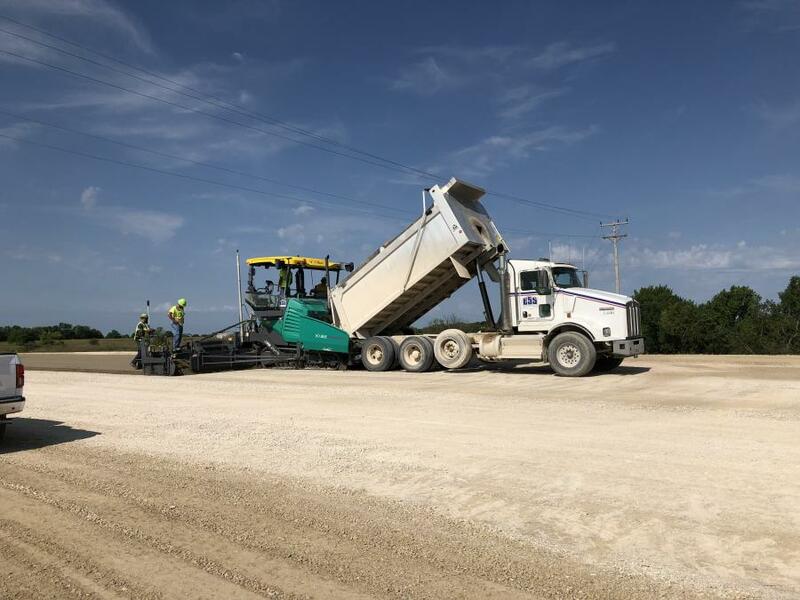 Crews from Emery Sapp & Sons Inc. started work in May on the Kansas Department of Transportation's (KDOT) $16 million pavement reconstruction of a 7.12 mi. section of U.S. 169 in Allen County, from Minnesota Road south to Delaware Road. The key element is to replace the concrete pavement on the mainline and interchange ramps and establish a new subgrade base. New box culverts and underground water infrastructure also are being installed. 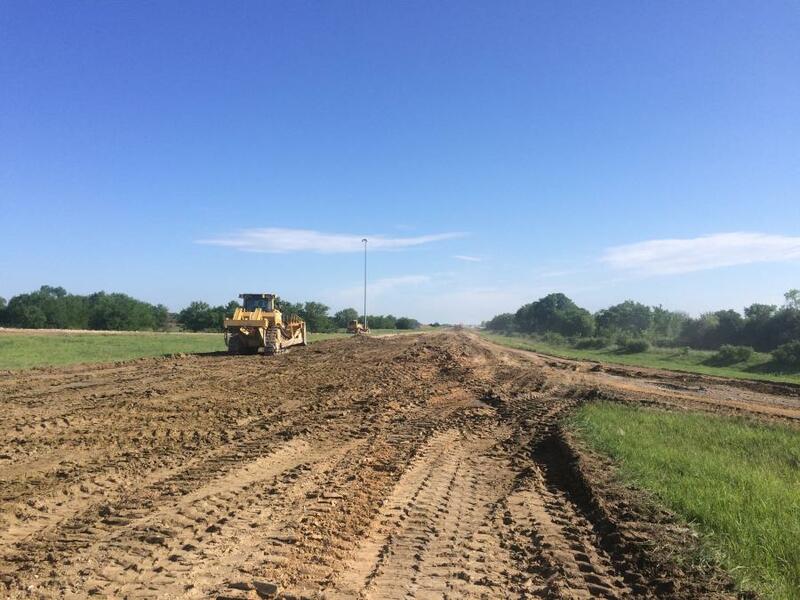 The project is funded under the Heavy Preservation portion of the KDOT's T-Works highway program and is expected to be completed in June 2019 at the latest. 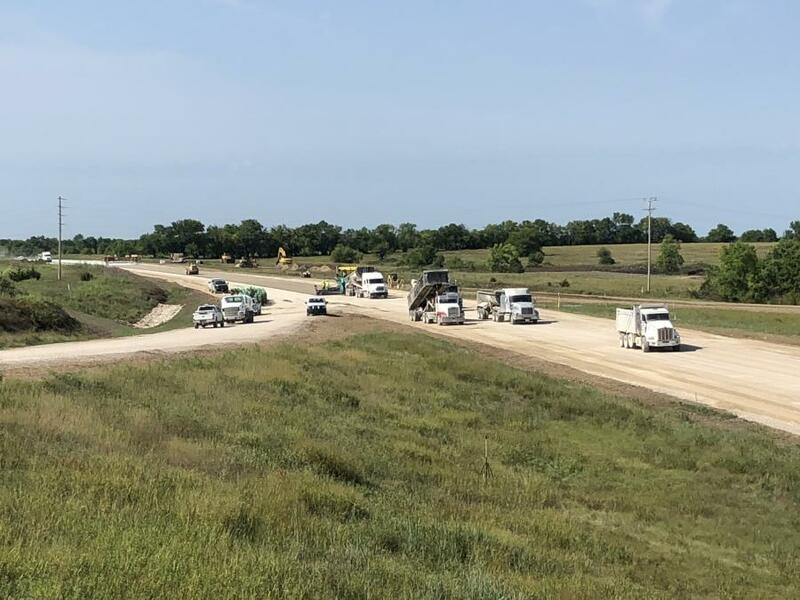 "Under the Heavy Preservation designation, projects included bridge replacements or major road rehabilitation including substantial milling and overlay, as well as pavement replacement," said Darrin Petrowsky, KDOT area engineer at the Iola office. "Both state and federal funds have been approved to be utilized in this project." 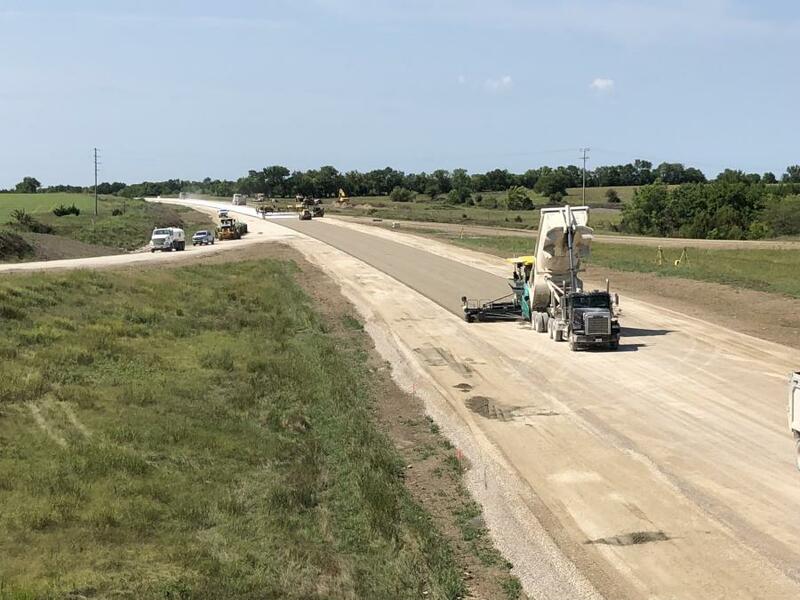 KDOT is replacing the existing, 24-ft. Portland cement concrete pavement roadway, which included a combination of 3-ft. asphalt and 7-ft. aggregate shoulders, with a 24-ft., non-reinforced dowel-jointed PCCP roadway and 10-ft. PCCP shoulders, Petrowsky said. It also is replacing the mainline and shoulders associated with all the ramps at the interchanges of U.S. 169 with Minnesota Road, Hawaii Road, and Delaware Road, he added. The existing road was completed in the mid-1980s with a pavement that consisted of 20-degree skewed joints with no dowel baskets. A 2017 traffic count showed that 4,820 vehicles used the road daily, and the new one will be able to handle traffic volumes in the 7,700 range up to 2038. 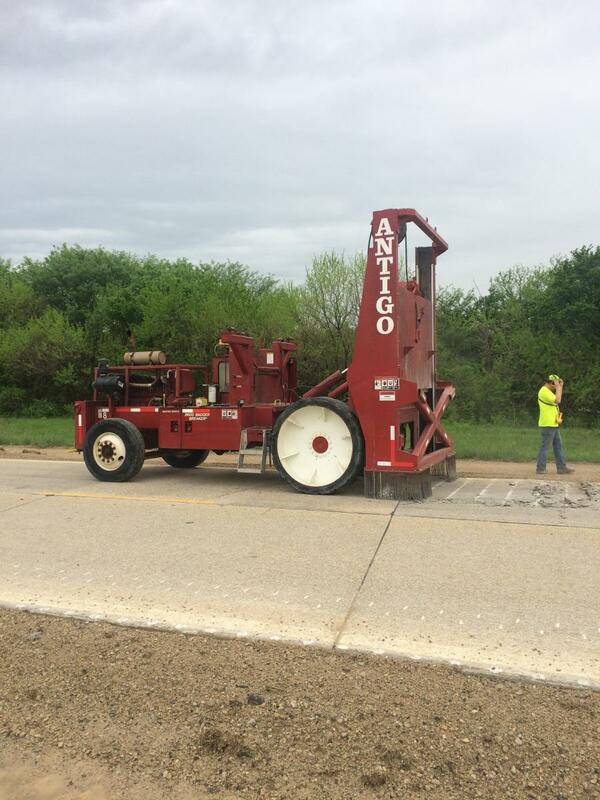 "Over the past several years the KDOT had let several PCCP patching projects, periodically adding diamond grinding to this section of roadway to address the continual degradation of the roadway and improve rideability on this corridor," Petrowsky said. 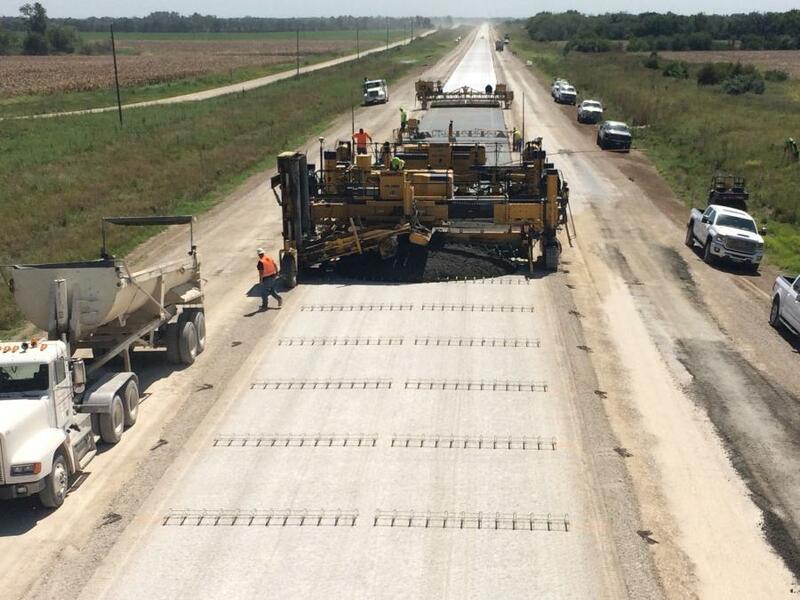 "In conjunction with the PCCP patching projects, KDOT maintenance crews out of Iola would do additional concrete patching. With the passage of the T-Works Highway program, a project of this type was a priority of our local and district KDOT office, and KDOT had a portion of the funds designated for preservation type projects. We designated a 26.1 mile stretch of U.S 169 as a priority for our district." Public consultations, which included Area Engineers and GBA Architect Engineers, confirmed that a new road was needed. "George Dockery, area engineer in Pittsburg, and myself worked together with the design consulting firm and our design engineers in Topeka to identify a project that would replace almost 19 miles of the corridor," said Petrowsky. "KDOT headquarters later separated our one project into two separate projects to move forward with potential construction. This is the first project of those two projects." The second project is moving forward with final design and if approved, a potential letting for the construction in 2019 is possible. GBA designed the new road infrastructure. To address subgrade water issues, KDOT partially changed its standard design profile, Petrowsky said. In lieu of the typical 6-in., lime-treated subgrade and cement-treated base, a 4-in. cement treated base will be placed on top of the aggregate base material under the mainline section only, with 9.5 in. of NRDJ PCCP for the mainline pavement and a typical shoulder cross-section consisting of 13.5 in. of aggregate base and 6 in. of PCCP. The project also calls for two separate test sections to be constructed for further evaluation to be performed by KDOT's research department, with assistance from state universities. Under the test sections, the separation geotextile fabric is being replaced with a geosynthetic reinforcement (for base) material, Petrowsky said. This is being performed in lieu of the 12-in. cement treating of the subgrade through these sections. KDOT specifically called for Mirafi H2Ri geosynthetic material to be used because it plans to test the wicking properties the manufacturer states this material has, he said. The test requires the contractor to construct a 100-ft. transition section in which cement-treated subgrade is not replaced, and to transition the thickness of aggregate base material from 6 in. to 18 in., with the geosynthetic reinforcement for the base material installed between the subgrade and the aggregate base material. One test section will consist of 18 in. AB-1 aggregate base material and the other of 18 in. of AB-3 material. Sensors will be placed at various depths in each section to record the moisture content and evaluate the effectiveness of the materials' wicking properties. The traffic management plan includes temporary lane closures, with detours on local roads and state routes for Phases 1 and 2 of the project, which will keep traffic completely out of the work area and eliminating the need for barriers. The highway will remain closed between Minnesota and Delaware roads until the project is finished in the spring of 2019. "The only thing that changes from each phase of construct is on how truck traffic is supposed to get to and leave the city of Humboldt" said Petrowsky. "Under the first phase that is from the south end of the project, and for the next phase of construction that will be from the north end. Electronic maps apps such as Google Maps and TomTom are directing traffic around the work zone utilizing county and city roads, instead of reinforcing the state detour route being signed." Phase 1, covering 4.5 mi. of road, began in May and should be completed in late November or early December. 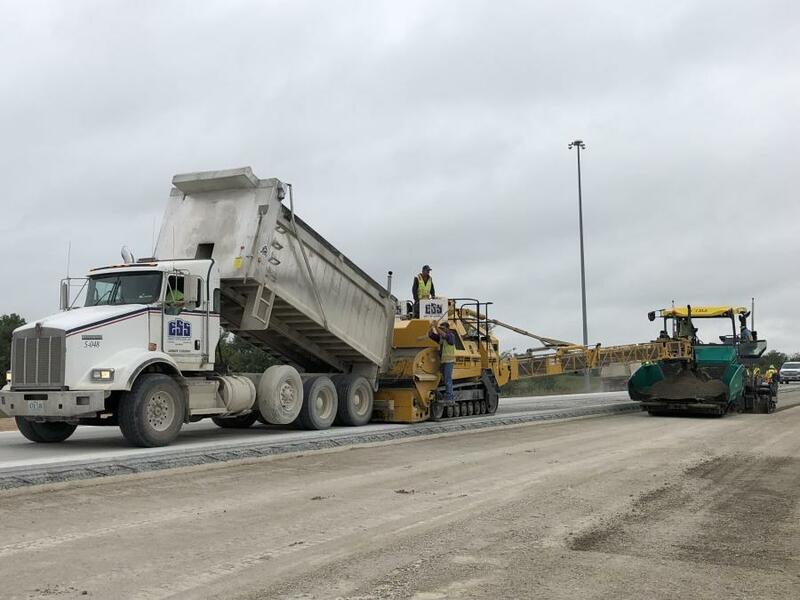 "The existing pavement experienced failures due to subgrade issues," said Donnie Stevenson, Emery Sapp's project manager, "so we're removing the existing pavement, base rock, and the 18 inches of subgrade. We're doing a subgrade stabilization and a complete rebuild. We're getting ready to finish Phase 1 and open it up to traffic." Phase 2, which covers 2.5 mi., will require crews to work during the winter, and Stevenson said he appreciates the value of a safe construction zone. "We'll do all the pavement removal and grading and essentially have it done by the time the cold weather breaks in the spring to start soil stabilization," he said. "We've run into a few challenges. The soil stabilization called for a cement-treated subgrade. Once we got on site and did some testing, we found there was a high moisture content. We figured out that using a straight cement would be really tough to do, and we put together a value engineering proposal (VEP) to use live kiln dust in conjunction with cement. There have also been a couple of unsuitable sections that we ran into, and we had to overdig those areas and install a granular drainage blanket to drain them." Several landowners are allowing Emery Sapp to set up a portable concrete batch plant, various staging areas, and offices. Three specific properties are being used as waste areas for the pavement and dirt being removed. Stevenson had sufficient time to plan the schedule, with the project being awarded to the general contractor last February. "It's an accelerated project," he said. "We were able to get all our permits and environmental clearances and put a schedule together to be able to hit the ground running." The work started with the arrival of the spring rains, which lengthened the time required to remove the pavement and subgrade. However, this work was completed in two weeks. Antigo Construction Inc. was responsible for breaking up the road surface, which took one week. "Then we came in and did all the pavement and subbase removals," said Stevenson, noting that once a sufficient amount of materials were removed, various crews were able to start with the rebuilding effort. "It wasn't a start-to-finish deal — we were working in multiple areas. We had two box culvert crews going as well that we had to work around, and we had waste areas on the north and south ends. We worked from the middle to allow the box culvert crews to do their installations of the new underground infrastructure." The pipe being installed includes 24-in., 30-in., 36-in., 42-in. and 48-in. cross-road reinforced concrete pipes. While there were no utility issues for Phase 1, a major gas line will be encountered during Phase 2. "There are several restrictions we have to follow to work around that," said Stevenson. "Our crews have developed a good rhythm and know the lay of the land." While Emery Sapp has completed many KDOT projects, this is Stevenson's first KDOT job, and he said he has developed an excellent working relationship with Petrowsky. "We submitted the VEP, and he helped us through the process," he said. "We employed the kiln dust/cement option on other projects. The guys from KDOT Materials had a lot of interest in it and are trying to use it for other projects going forward. KDOT has been very quality oriented — they have strict specifications in the state and build a quality roadway. We've also had good relationships with the inspectors." Approximately 211,941 cu. yds. of common excavation and 37,957 cu. yds. of rock will be removed, with much of the material being used to fill low spots, capped by dirt, for landowners who want to level off areas for pasture. The new road is based on 12 in. of stabilized dirt, 6 in. of baserock, 4 in. of cement base, and a mainline concrete cover of 9.5 in. Mainline concrete pours have been around 2,800 cu. yds. a day. Pours in the summer months required nearly two days before they could support vehicles driving on them, whereas pours in the cooler weather take four days to set. New materials for the road will include several hundred thousand sq. yds. of concrete, 55,960 lbs. of reinforcing steel, and a variety of other products. Having an onsite batch plant made sense for the project, which is located in a relatively isolated area. "There are no concrete manufacturers in the area that could supply the amount required every day," said Stevenson. "Most of their plants are 120 cubic yards an hour and they've got other customers to service. Whereas our plant is dedicated for our operation, and can do 280 to 300 cubic yards per hour. Any time we're paving, we have an onsite mechanic for the paving equipment and we have specific personnel for the batch plant." Crews, averaging 25 to 30 people, work day shifts Mondays to Fridays, with occasional Saturday operations when needed. The subcontractors include Cillesson & Sons for traffic control items; J&J Contractors Inc. for RCB items and construction ditch liner; Schrimpf Landscaping Inc. for erosion control items, including temporary and permanent seeding; Fulsom Brothers Inc. for permanent signage and guardrail installation; B&B Bridge Company LLC for bridge repair items; Antigo Construction Inc. for rubble-izing old construction pavement; and Mount Carmel Sand and Gravel for cement treated base items. Emery Sapp crews are using Cat D6T, D8T and D9T dozers, and a John Deere 650K dozer; a John Deere 772GP motorgrader and a Cat 14 motorgrader; Cat 745C trucks pulling MTS MT42 scrapers and Volvo A60H trucks pulling KTec 1263 scrapers; a Komatsu PC490LC-11 excavator; Cat 745C dump trucks; a Vogele paver; a GOMACO 2800 paver and a 9500 trimmer; Cat and Hamm smooth drum rollers; and John Deere wheel loaders. Main wear and tear issues involve hydraulic lines and other normal maintenance issues, with repairs done rapidly by mechanics visiting the site as needed. "We didn't have any outstanding maintenance issues on this job," said Scott Zepp, Emery Sapp's equipment manager. "It was serviced by our own mobile mechanics, along with some support from equipment dealers. We try to do most of our own repairs, but rely on dealer support during busy times of the year. We also rely on the manufacturer trained technicians to provide experience on new machines and technologies. Dealers have resources available to them to keep technicians trained on the newest technologies coming out of the factory. The end-users don't always have this type of training available." Emery Sapp's dealers include Foley Equipment for Caterpillar equipment, Murphy Tractor for John Deere equipment, Van Kepple for Volvo equipment, and Road Builders for Komatsu equipment. "Individual dealerships and the OEM's provide technician training opportunities throughout the year on different machines and systems," said Zepp. "We try to take advantage of these whenever they are offered." Foley EquipmentKansasKansas Department of TransportationMurphy Tractor & Equipment, Inc.
Foley Equipment Kansas Kansas Department of Transportation Murphy Tractor & Equipment, Inc.